Zone: 3 hectares in the cru Ginestra. Of the superb area of Ginestra di Monforte, Clerico has a small portion, facing south-east, called Pajana which this beautiful Barolo is born, elegant in touch and in the absolute lack of heaviness, confirming once again the small miracle Clerico. Yield: 38 hl per hectare. Vinification: maceration on the skins in the rotary macerators for 20 - 30 days. 24 - 30 months in French oak barriques (80% new, 20% second passage). Description: Very dark garnet, it has a severe and ethereal olfactory tone, spicy and fruity, full of aromas of ripe red and black fruit, licorice, cinnamon, plum. A very thorough wine with an impeccable raw material, which can give rise to long discussions about the full recognizability of Barolo when it appears on the palate, oak in the foreground and, above all, all that sapid-acid vigour behind it. The balances are not currently resolved, but such overbearance certainly requires time. Certainly to be bought, but to be consumed much later. Serving temperature: 16 - 18°C. Ageing possible: min. 10 years. "Falstaff Magazin" has rated the wine "Domenico Clerico Barolo DOCG, Piedmont, Italy" from the vintage 2012 on 25.11.2016 with 91 of 100 points. "Wine Enthusiast" has rated the wine "Domenico Clerico Barolo DOCG, Piedmont, Italy" from the vintage 2011 on 07.01.2016 with 89 of 100 points. "Wine & Spirits Magazine" has rated the wine "Domenico Clerico Barolo DOCG, Piedmont, Italy" from the vintage 2011 on 01.12.2015 with 88 of 100 points. "Wine Spectator" has rated the wine "Domenico Clerico Barolo DOCG, Piedmont, Italy" from the vintage 2011 on 31.08.2015 with 90 of 100 points. "Wine Spectator" has rated the wine "Domenico Clerico Barolo DOCG, Piedmont, Italy" from the vintage 2002 on 31.12.2006 with 84 of 100 points. "Vinum Wine Magazine" has rated the wine "Domenico Clerico Barolo DOCG, Piedmont, Italy" from the vintage 2002 on 01.09.2006 with 16 of 20 points. "CellarTracker" has rated the wine "Domenico Clerico Barolo DOCG, Piedmont, Italy" from the vintage 2011 with 91 of 100 points. "CellarTracker" has rated the wine "Domenico Clerico Barolo DOCG, Piedmont, Italy" from the vintage 2012 with 91 of 100 points. 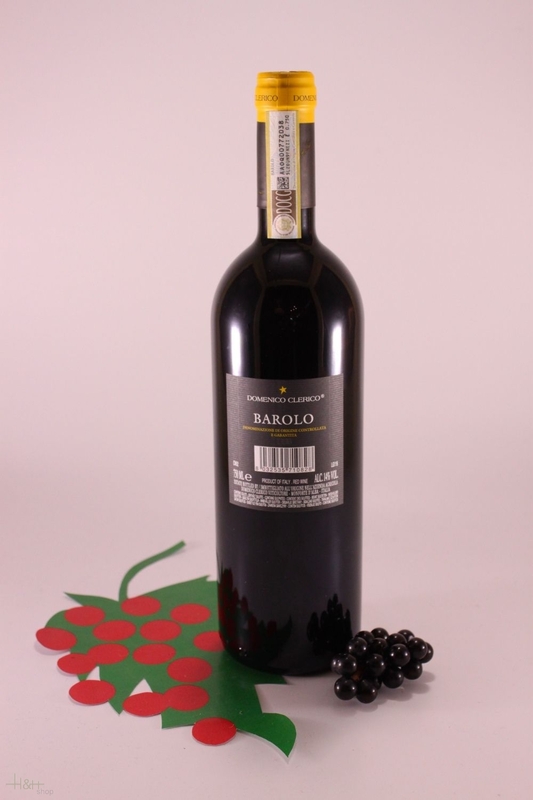 "CellarTracker" has rated the wine "Domenico Clerico Barolo DOCG, Piedmont, Italy" from the vintage 2002 with 88 of 100 points. 86 - 88 of 100 Points. "Stephen Tanzer" has rated the wine "Domenico Clerico Barolo DOCG, Piedmont, Italy" from the vintage 2002 with 86 - 88 of 100 points. Purple Rose - 2017 - winery Castello di Ama 23,15 EUR / 30,87 €/lt. Baia al Vento Bolgheri Superiore - 2015 - Tenuta Campo al Mare 35,55 EUR / 47,40 €/lt. Barolo Vigna La Rosa - 2006 - Kellerei Fontanafredda 56,80 EUR / 75,73 €/lt. Carmignano Riserva - 1993 - Winery Farneta 29,00 EUR / 38,67 €/lt. Bricco dell'Uccellone Magnum - 2016 - Braida di Giacomo Bologna 104,80 EUR / 69,87 €/lt.